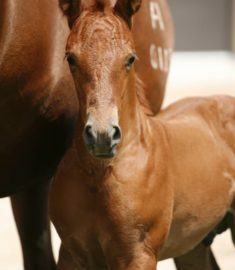 Capuchino Forever is the cloned colt of legendary Paso Fino, Capuchino. The chestnut stallion’s accomplishments and impact on the Paso Fino breed in the United States are unparalleled. Coined the “Horse of the Millennium”, Capuchino’s sound and rhythm, powerful hind-end and extreme collection redefined the prototype for the breed. Outside of the show arena Capuchino proved his genetic prepotency by earning the title of No. 1 Top Ten Stallion for 11 consecutive years. Although the stallion died in early 2009, his genetics were preserved and Capuchino Forever will be able to carry on the legacy of the famed Paso Fino. Capuchino Forever’s owner, Zarela Olsen, plans to stand the colt as a stallion when he reaches breeding age. “There will never be another Capuchino,” says Olsen. “But when I stepped into the stall and saw this foal for the first time, I couldn’t believe my eyes. Capuchino, you are back,” she said.